Our new and improved granite slabs moseyed into town this week and, unlike our last visit to the stoneyard, it was definitely love at first sight. Here’s Sherry gettin’ friendly with our two hunks of Pashmina before they go in for cutting. The best news of the day was that our beautiful new counters are coming home on Tuesday. Score! That means our Home Depot installer can come back on Wednesday to hook up the plumbing and – dare I say it? – our new kitchen will be COMPLETE. 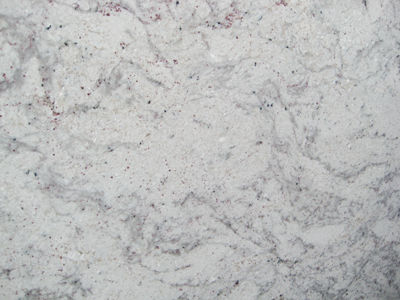 ‘Til then, you’ll find us drooling over this photo we snapped of our soon-to-be countertop. Very nice! Can’t wait to see it installed. We can’t either. We’re basically holding our breath. Thanks for being such a good little commenter. We love the blog love! Good lookimg granite lets’ hope the installers do it right.